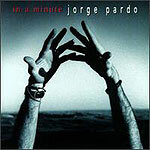 CD reviews: "In a Minute," "L'accordeoniste," "Mon Legionnaire," "Blow Up," "Paris Musette, Vol. 3" and "The Rough Guide to the Music of Portugal"
These reviews first appeared in the September 12, 1998 edition of the American Reporter. A handful of releases of Spanish, Portuguese and French music illustrate quite clearly the growing internationalization of what might be called modern chamber music. Taking in such disparate styles as Argentinean tango, Jewish klezmer, American jazz, French-Canadian Quebecois and Portuguese fado, modern chamber music is distinguishable and identifiable by its combination of structural complexity, instrumental virtuosity and a certain darkness of mood. Increasingly, these different musics are interrelated as the artists of each tradition borrow from each other. For instance, in combining American and African influences to flamenco, contemporary Spanish artist Jorge Pardo does for his nation's music what the late Astor Piazzolla did for tango  he takes a once rural music and makes it into a smart, sassy and sophisticated form. As Piazzolla's music was dubbed tango nuevo to differentiate it from that of more moribund artists, so is the music of Pardo and his peers known as flamenco nuevo. Pardo's music is unbound by flamenco's traditional structure, yet retains the spirit and sounds of flamenco. He toys with the instrumentation (he himself is a flutist and saxophonist, most definitely not generally associated with traditional Spanish music), with the rhythms (a strong Mideastern influence, with Afro and Caribbean themes as well) and with the solos (jazz-style improvisation is emphasized). Indeed, on one cut, "El Espejismo," there is a strong dose of Native American melodic themes. The beauty of Pardo's new album is that with all these different influences swirling about, the music never gets lost, never loses its sense of direction. There is a tightness about the entire recording that speaks to Pardo's vision of where the music should go. Outside of Frank Sinatra, it's hard to think of a singer who so defined an entire generation as did Edith Piaf. Hers was the World War II generation of France, the generation of Camus, Cocteau, de Beauvoir and Sartre; the generation of the French Underground and the Vichy puppet regime. 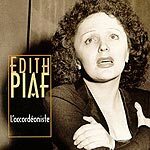 Two new collections of Piaf's recordings from the war years capture an artist every bit as sophisticated and universal as any  and one far more influential than most. In fact, of all the CDs reviewed in this batch and last week's tango roundup, the only one not owing a huge debt of stylistic gratitude to Piaf is that of early tango master Carlos Gardel, a contemporary of hers. Along with Marlene Dietrich and, later, Billie Holliday, Piaf invented the weary, seen-it-all woman of the world. While not overtly influenced by jazz in her singing and composing, Piaf was hugely popular with the jazz fans (and musicians) of her time  she had that certain feel that the best jazz players achieve, a sense of swinging beneath the music, of possessing a natural rhythm so perfect that you need not speak a word of French to know just what she's saying. She was not so different from a really outstanding jazz instrumentalist in that regard. Piaf's music is of a natural and deeply felt noir; she could have provided the soundtrack to every Bogart film ever made. If it hadn't been Dooley Wilson singing at Rick's Place or Hoagy Carmichael tickling the ivories in "To Have and Have Not," then it would have been Piaf. Like Sinatra in the latter part of his career, Piaf epitomized the salon singer  an artist who could make an entire room cry from the sorrow her singing could project, the consummate artisan whose very voice conjures images of dark bars with blue cigarette smoke curling along the ceiling, of men in snap-brim fedoras and women wearing carnations. What this isn't is party or dinner music. This is deeply contemplative, cry in your beer kind of stuff here. When you're alone and your heart is breaking and you don't know how to face the night, you put Piaf on the stereo, turn the lights down low, pour yourself a glass of red wine or a fine sherry, light a cigarette and commiserate with one of the best who ever sang of having your guts ripped out. Paris Musette is a project similar to the "Will the Circle Be Unbroken" album by the American folk/rock band Nitty Gritty Dirt Band  only instead of the Americans' pairing of young, longhaired hippies with the elder statesmen of bluegrass, Paris Musette brought together some of France's best young musicians and some of its most beloved masters of the old styles of popular French music. As with the Stevenson Palfi documentary on the blues, "Piano Players Rarely Ever Play Together," some of the principals of Paris Musette passed away during the project, leaving Vol. 3 the last in a planned series of four. 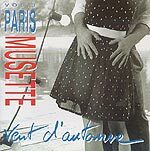 The music of Paris Musette is the kind that typifies Paris, especially for those of us who have never been there. Surely this is the music Madeline listened to, the music Hemingway heard while dining on the Left Bank, the music Sartre tried to blot out while writing. The accordions play a lilting variation of waltzes and foxtrots with a certain Gallic air to them  can a waltz insouciantly shrug? The guitars punctuate the accordions' leads, the violins add a dark tone. It is all very traditional, very much  50 years later  in the mood of Piaf's era. But as in her era, specifically as with the big band swing, the music of Paris Musette shows that entertainment and art can peaceably co-exist. There is some wonderful playing here, solos to break your heart  and hands-down a load of accordion players who are among the world's best. The liner notes do a nice job (in English) of explaining the different styles played and give a little bit of info on the players involved with the project. Here's hoping they put all three volumes together in one set for those of us who are suckers for French style done well. The duo of Richard Galliano and Michel Portal is much more experimental than the Paris Musette. This is wild, dark, brooding, swirling music, reminiscent of both Piazzolla's tangos and the ongoing klezmer renaissance of New York City. Galliano's accordion style is actually pretty close to Piazzolla's  he plays short, compact passages with very few lengthy melodic lines. It's a dark, brooding voice he possesses on his accordion, but one that is distinctive and stark. Portal plays a variety of reeds (most notably a bass clarinet) and a bandoneon, the smaller cousin of accordion that was, actually, Piazzolla's instrument. Not coincidentally, the two cuts where Galliano and Portal play accordion and bandoneon together are both tangos, one of them written by Piazzolla. It is these two songs, "Libertango" by Piazzolla and "Little Tango" by Portal, that best illustrate the interrelatedness of modern chamber music. They are two Frenchmen playing an Argentine form, but with a very strong American jazz overtone. As mentioned, other cuts evoke the spirit and sound of klezmer, especially Galliano's "Taraf," which pairs accordion and clarinet, a popular voicing in klezmer; when you add in a dose of dissonance and discordance, the effect is eerie. Rough Guides is a new series of books exploring both travel and music. There are Rough Guides to jazz and classical, and Rough Guides to Brazil, Scotland and Bali. The travel guides come with accompanying musical CD, or you can buy either separately. One of the most recent titles in the Rough Guides CD series is dedicated to Portugal, which fits in well with this week's theme. Just as Spain has its flamenco and Argentina the tango, Portugal has the fado. While the Rough Guide to Portugal touches on far more traditions than simply fado, it also contains a nicely distilled history of recorded fado, from early in this century up to present interpreters. Fado is similar to the Parisian salon style in tone and color, but has its own distinctive, Iberian influences that are equal parts European and Moorish. The heart of fado is the combination of acoustic guitar and voice, making it somewhat a cross between flamenco and salon, although that's more a listener reaction than musical history. All of the music here, though, has a grace and style that mark them as uniquely Portuguese. The combo Realejo displays a Celtic influence in their Medieval revival music built around the hurdy-gurdy (an old stringed instrument), while early fado star Maria Teresa de Noronha has a vocal range that has to be heard to be appreciated. Rondo Dos Quatros Caminhos is another traditional revivalist band that brings to mind early Steeleye Span or Fairport Convention. Each band is another mini-discovery, and, according to the liner notes many of these artists have albums in print, making the Rough Guide more of a treasure map than a single-disc compilation. Most likely due to licensing contracts, the popular Lisbon band Madredeus isn't included here, despite their visibility on the international stage. A loss at that, too, given the purity of Teresa Salgueiro's voice and magnificence of Pedro Ayres Magalhaes' guitar. Still, when the only complaint about a compilation is that a single band is not present, that's a statement all its own on the quality of what is there.